When Chabad of Monroe executive director Rabbi Yehuda Spritzer took artist Maurice Mahler to see the ark in the new $1.5 million Howard H. Berger Chabad House, the Monroe resident noticed a large open space at the top of the 14-foot-tall wooden structure. Mahler realized could he fit a stained-glass window inside the gap, and designed one that represented the etz chaim, the tree of life. “What would be more perfect than an etz chaim?” he said. The artist had already designed several other windows that serve to beautify the structure, most representing mitzvot championed by the late Lubavitcher Rebbe, Menachem Mendel Schneerson, and another that represents moshiach, the Messiah. The 6,300-square-foot building on 3.5 acres opened its doors for the first day of Rosh HaShanah, more than three years after breaking ground. The site, which, like the previous location, is on Applegarth Road, provides some much-needed space to enable the 15-year-old Chabad house to expand its programming and services. The new building contains a synagogue, social hall, kitchen, and the first-ever mikvah in Monroe, as well as Hebrew school classrooms and administrative offices. Fifteen cars could park in the old site; this one fits 65. “The setting is beautiful and tranquil and we can now have activities outside,” said Spritzer. One of things he most looks forward to is having designated spaces for various activities, rather than shared space for all events as they were forced to do in the 1,100-square-foot building the Chabad formerly occupied. Should the need arise, there’s room on the property to expand. Spritzer said that because the building has a kitchen, its Rita’s Bistro lunch, offered weekly on Tuesdays, can be prepared on-site. Len Posnock, a resident of the Encore adult community in Monroe Township who is active in Chabad, said that Spritzer personifies the charm of the Lubavitch movement. Mel Berger, who has been active in the Chabad since moving from Staten Island to the Stonebridge adult community in Monroe Township six years ago, and his wife donated the cherry wood Torah-reading table. The retired New York City science teacher, who in his early years lived seven blocks from Lubavitch headquarters in Crown Heights, Brooklyn, couldn’t stop raving about the new facility. The Chabad, which plans on holding a grand opening in November, holds weekly Talmud and Torah classes and a twice-weekly “Ask the Rabbi” program. 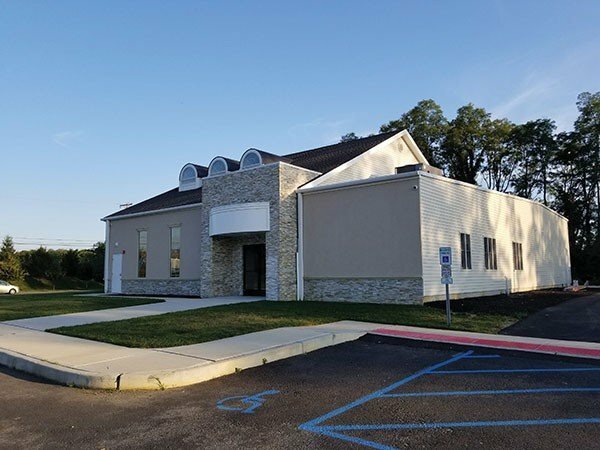 The new Chabad house is named for the late owner of the Howard Berger Company in Cranbury — formerly of Monroe — a supplier of security and builder’s hardware, plumbing products, paint applicators, and home environment products to retailers. Before his death, the resident of Point Lookout on Long Island made a $370,000 commitment to the structure.